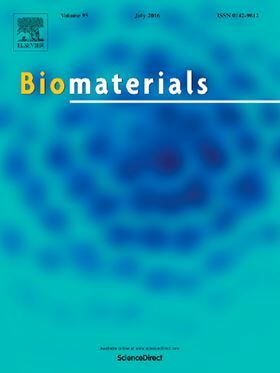 The journal Biomaterials continues to pride itself for publishing the best content in its field. Under the leadership of Prof. Kam Leong and his team of editors, all leading researchers in their areas, Biomaterials serves its community with trend-setting biomedical science and engineering articles. An example of this was the exciting story told by the Hirobe et al. paper about a dissolvable microneedle patch to vaccinate against influenza which we highlighted last year in July on Elsevier Connect (Biomaterials, Volume 57, July 2015, Pages 50-58). Now, for the first time in the journal’s history, our extended team of expert editors has selected 3 outstanding articles (published in 2015) that make fundamental contributions to the field. As a result we have created new Biomaterials journal awards to honor the winning authors at the upcoming World Biomaterials Congress in Montréal, Canada. We are also delighted to revive the Top Images in a Year poster which we will be unveiling in Montréal. The Biomaterials team of editors is one which breathes passion, dedication and a healthy diversity of expertise. These strengths are essential to provide our authors with the best peer-review. In a time when swift decisions are crucial to scientists, we provide fast first-decision on all submissions. Statistics for the first quarter of 2016 show this is within 4 weeks on average. If your manuscript proceeds for peer-review we deliver a constructive, fair assessment by a minimum of 2 of our excellent reviewers. Peer-review is a collaborative enterprise which editors and reviewers undertake to provide fellow researchers the opportunity to share their scientific stories in a clear and appealing way. At Biomaterials editors strive to provide authors with clear guidelines when writing. For this reason we felt it was important to update our Guide for Authors. Please consult our journal homepage for the clarifications on Human and Animal Rights or on Informed Consent and Patient Details among some of the added topics. We also are very excited to announce that Biomaterials has joined the Elsevier Reviewer Recognition Platform (RRP). This innovative feature records and acknowledges the efforts of the reviewers without whom the advancement of sound science would not be possible. When you review for Biomaterials you will see this reflected in your reviewer profile. Biomaterials joins the RRP as editors have been enabled to actively nominate their best referees for a Certificate of Excellence in recognition of their reviewing quality. Finally, I would like to invite you to come and listen to our expert editors, reviewers and authors reporting on their latest findings and giving useful tips on successful academic publishing at the World Biomaterials Congress. Join us at the Emerging Concepts in Biomaterials Science symposium on Wednesday May 18 to learn about trailblazing research in Biomaterials and ask your questions about publishing with Biomaterials to our team at the Meet the Biomaterials Editors workshop on Saturday May 21.